thickcrust.com: Why can't I stop taking pictures of horrible and disgusting things? Why can't I stop taking pictures of horrible and disgusting things? 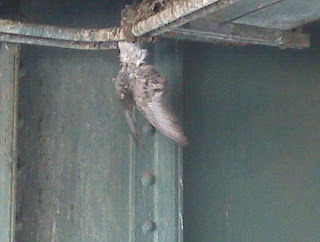 A month or two ago Kelley noticed a pigeon trapped in the wires under the elevated tracks of the F train. The bird was flapping wildly, desperate to free itself and resume its usual routine. I wonder how many MTA employees have looked at this dead body and said, "Not my job!" Unfortunately, that was not meant to be. The next morning, as I climbed the stairs to the subway station, I looked for the bird. It was dead. Today I looked for the pigeon. It was still there, and still dead, hanging like a sick bat. This was the size of a squirrel, but a little better behaved. 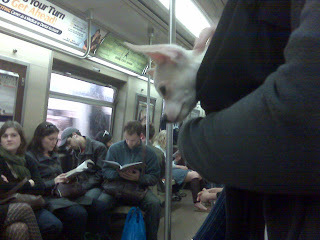 A short while later, Kelley, Fay and I were riding the F train into the city. I was looking at Kelley, who said something about me not liking "those". I looked over and noticed a tiny animal about 12 inches from my face.